What's big and orange and can kick your arse? Using his massive propellers to fly through the sky or bash his enemies, Toa Pohatu is as tough as they come. His Mask of Speed and shoulder-mounted Midak Skyblaster make him a devastating fighter. They're not just saying that, either, it's got real science backing it up: no one comes off best in a tussle with a helicopter blade. Just look at whatsisname from ER, or that zombie in Dawn of the Dead (the real one, not the music video remake), or the big German mechanic in Raiders of the Lost Ark - it's a propeller blade, it counts. And the thing is, those were accidents - this guy's blades are meant to be used as weapons, and he's trying to hit you with them. If I were a member of the Brotherhood of Makuta (assuming they didn't kick me out for complaining about the sexist name), I'd steer well clear of him, I'll tell you that. 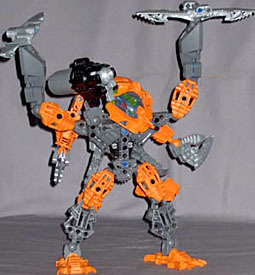 Pohatu's built to match his reputation, and not just in the way he's got whirling blades of gory death for hands. 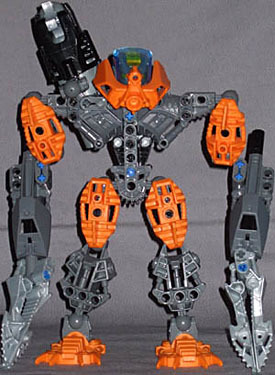 Your average Bionicle of this scale will have a single upper body piece, with the balls for the shoulder joints built into it; Pohatu's chestplate joints, by two Technic plugs each, to separate shoulder pieces, widening his body considerably compared to the norm. Added to that he's got short, stocky legs, the bulky housings for the blade units as his forearms, and his colour scheme which has the majority of his body in gunmetal grey, which the orange highlights make look more dark, and he certainly looks the part for a powerhouse. Only his mask is out of place, with its clear shell covering his head, armoured only at the front and sides - although, since it's a Mask of Speed, perhaps it's more appropriate to look like this, rather than being a big all-encompassing crash helmet of a mask. It does make you wonder what his weakness is, since normally the tough guy is the slow guy. 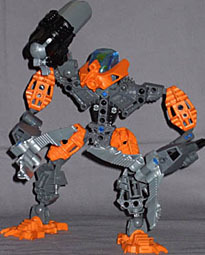 Maybe, in between beating up Makuta, Pohatu's the annoying one in Toa roleplaying sessions, always trying to min/max his character to have no weaknesses, rather than just playing in the spirit of the game like everyone else. Despite his bulk, Pohatu's got almost the same articulation as everyone else: three-axis balljoint neck, shoulders, elbows, hips, knees and ankles, all nice and tight so his own weight won't make him sag. The exception to the rule is his wrists, which due to the rotating blade feature are essentially swivel/pin joints - they're also the exception in that they're very loose, and although it is possible to pose his blade hands, if you bump him at all (or even look at him funny), they'll slip and flop downwards. 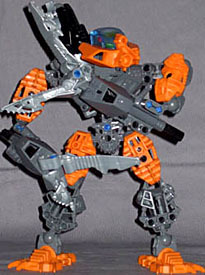 On the plus side, the blades work just fine as an action feature - the axle runs the length of the forearm, with the handle coming out beneath the elbow, and you can get a pretty good speed going on the rotors, certainly enough to knock the hell out of any other Bionicle they come into contact with. As if that weren't enough, Pohatu also has his Midak Skyblaster, mounted on a balljoint unit on his shoulder, since his hands can't hold anything. The Midak is an elegant launcher, which can hold up to four spheres, with a spring inside the tube to keep the spheres up front when there are three or fewer in the weapon. The spring doesn't power it, though - that's done by a three-spoked thumbwheel, which comes up behind the lead sphere and presses it against the restraining edges of the barrel. Once you push hard enough, the sphere will pop out - or rather, hurtle out and knock over anything it hits. The tolerance of the mechanism is very finely-judged - you're never pushing hard enough on the wheel to damage anything, or make it difficult to operate, but that sphere goes flying like a bat out of a Meat Loaf album. Like all the 2008 regular-scale Bionicles, Pohatu has a mounting piece on his back, allowing one of the smaller Matoran to come along for the ride - and since he's a Phantoka, not a Mistika, he actually matches his buddy, Photok. Admittedly they can't really do a lot together that they couldn't separately - Photok's stuck behind Pohatu's head, so his view wouldn't be great, and since he's dual wielding short swords he can't really pretend to be operating the Midak - but since they've got the same orange/grey colour scheme, and both are stocky, broad-shouldered-looking things, they make a decent pair. And I guess, though their range isn't great, at least Photok could take a swipe at any nearby enemies with his swords, leaving Pohatu free to use his rotor blades to keep flying.